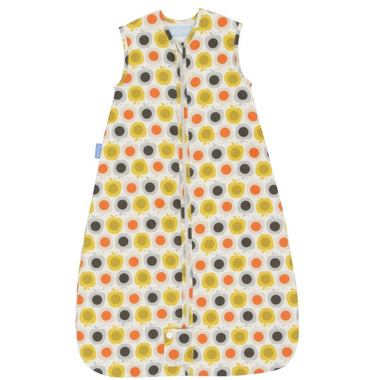 The epitome of Orla Kiely’s unique style, the apple print deserves its cult status. Clean lines and a unisex palette create a timeless classic that will never go out of fashion. A stunning addition to any nursery. Designed as a travel Grobag, it can be used with a 5-point harness in a car seat or pushchair. I love these gro bags! They keep my little one warm at night without worry. They wash well and have such cute designs! I have 2. Love the zipper option for sure! Only thing I'd mention is I believe them to fit small. My 10 month old is of average height/weight and will be outgrowing the medium size before 18 months for sure! Great sleep sac! Love the zipper instead of the snaps as my 9 mo daughter can easily get out of the snap style sleep sacs when she stands in her crib or crawls around. The five point harness access works really well for travelling as well and is velcroed closed when using in the crib so no heat loss at naps and nighttime. Will be buying a second!